Each year the Changana people celebrate their culture in various ways. such as dance. Xichangana is correct term if referring to the language. Machangana as a plural form of muchangana, referring to the people. Here below is some history of the smaller festivals that have been held, but they all embrace the same wonderful culture, read on for details and note the forthcoming festival at Chilo Gorge Safari Lodge! The MaChangana Chiefs of the south east lowveld and custodians of the MaChangana culture have appointed a committee to organise the MaChangana Culture and Arts Festival (MCAF). This festival is held yearly in different areas around Gonarezhou National Park, which is part of the Greater Limpopo Transfrontier Conservation Area, (GLTFCA). The committee includes Headmen, Kraal heads, Local MP’s, Councillors, members of the MaChangana Promotion Association and select women from each of the Chiefs councils. 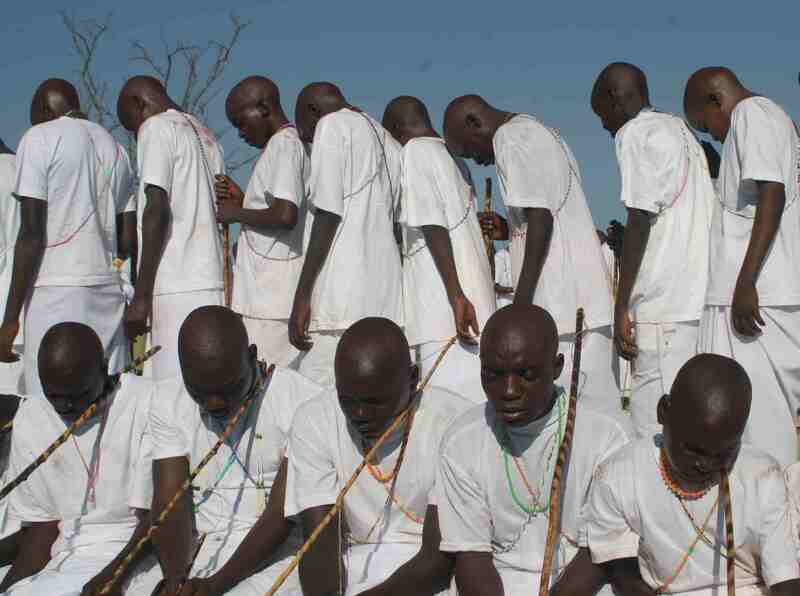 The MaChangana Culture and Arts Festival, 2011, was held at Chief Tshovani’s Village. The MaChangana Culture and Arts Festival, 2012, was held at Chief Mahenye’s Village. 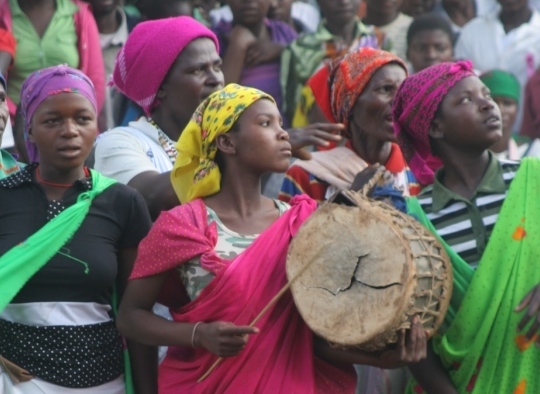 The MaChangana Culture and Arts Festival, 2013, was held at Chief Gudo’s Village. The purpose of the MCAF is to maintain the traditions and culture of the MaChangana people, to promote this unique culture amongst the youth and to ensure that this heritage be passed on to future generations. The MaChangana people are proud of their hunter/gatherer culture which recognises the importance of respecting the environment. They have long depended on sustainably utilising the natural resources which are to be found in this diverse and remote part of Zimbabwe. This Culture and Arts Festival promotes the history of early settlements and recording of historical events. Further, it promotes the rich and diverse traditions of the MaChangana people, which include dress and beadware, food and traditional hunting methods , music and dancing, poetry and story telling (Karengano and Tsekelelo ), home building and wall decorations, Saila (annual fish drives), male initiation to adulthood (Ngomeni), and female initiation to adulthood (Khomba). “Chibabela” skirts are deeply gathered and beaded skirts, worn under bright wraps and displayed when dancing or for special occasions. These skirts sway and flare out when dancing to create an exuberant and mesmerising effect. They are made from traditional striped, woven “Salempore” fabric and glass seed beads. Men and women wear earrings, but this is less common amongst the men than in the past. 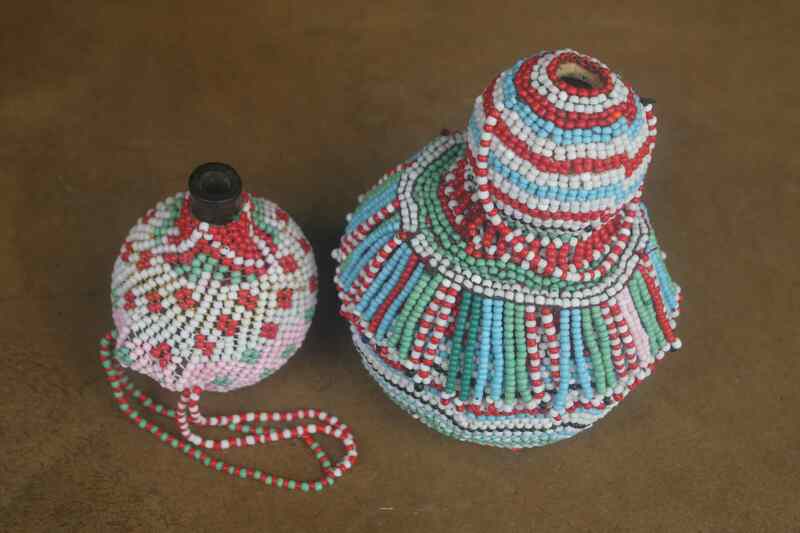 A strong tradition of using glass seed beads for decorating skirts and for necklaces is still maintained. Glass seed beads are treasured for decorating items of everyday use, such as snuff boxes and containers made from hollowed out wild gourds and squashes. Food is locally produced, maize and sorghum being staple crops. Grains are winnowed in traditional baskets (tsere) and hand-hewn pestle and mortars. Traditional beer is brewed from sorghum. Well-shaped, very large clay pots are skilfully made for storing beer and water, and for cooking every day meals.They are constructed from clay soil and earth-fires under piles of brush. Multi-coloured goats, chickens and domesticated guinea fowls and also the occasional contented wandering pigs, are to be seen around every homestead. Herds of spectacular Nguni-type cattle, the pride and joy of their owners, wander the banks of the Save River at Mahenye. Small, neat animals, they are are acclimatised to resist tick borne diseases and tsetse fly, and survive easily in this often-arid environment. 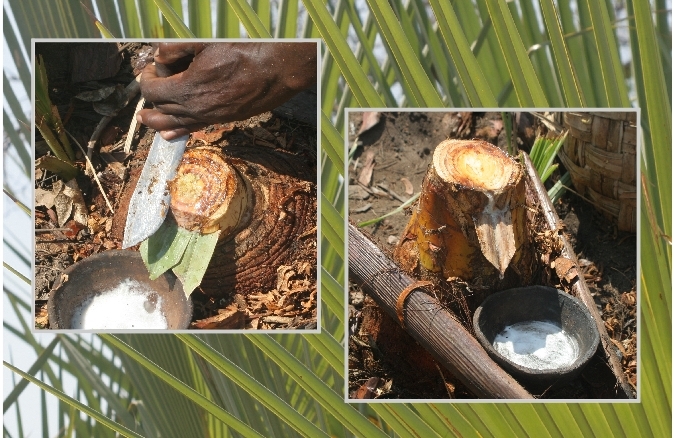 Delicious and potent palm wine is made by tapping the growing tip of Hyphaene palms (Lala palms), and fermenting the clear sap obtained. Fresh clear sap tastes delicious-somewhere between cucumber and coconut! Traditional hunting methods are revered, with the constrution of well-crafted, multiple barbed fishing spears, fish traps and bows and arrows. 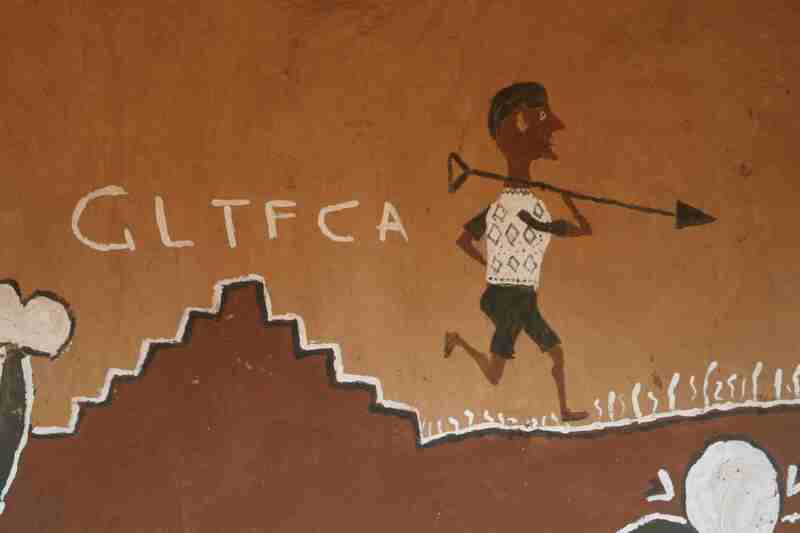 Below is a hut painting depicting hunting in the GLTFCA ! 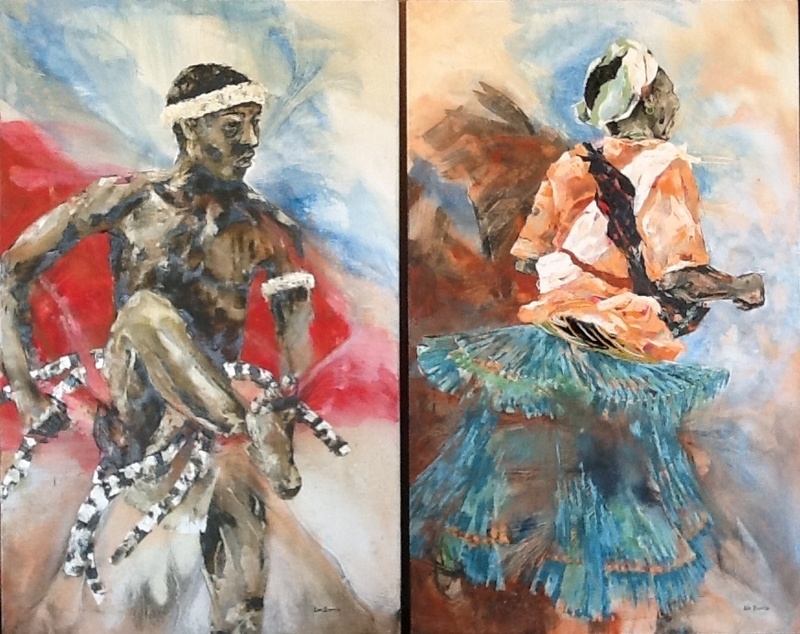 Many different, exuberant dances are performed, with names such as Muchongoyo, Chokoto, Marula, Chinyambele and Chigubu. Men wearing grass, cowrie shell and porcupine quill headresses and armbands, are often adorned with wild animal skins or goat skin skirts, and wear gourd leg rattles. 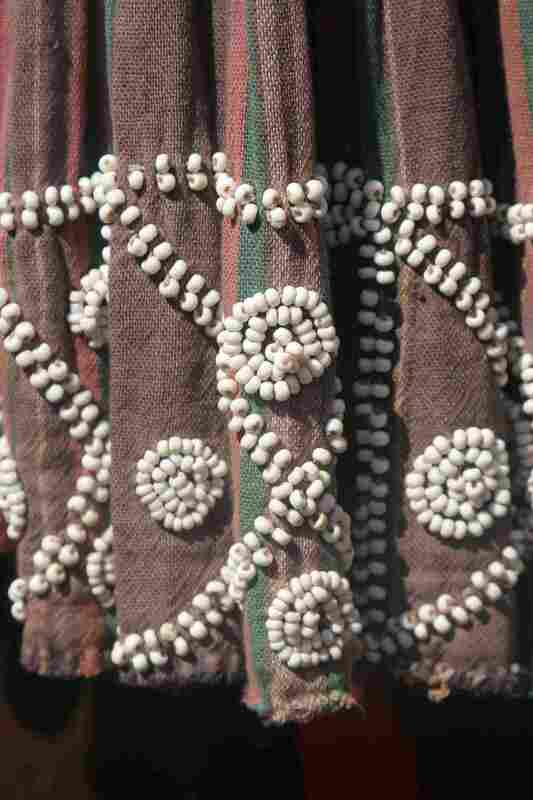 Ladies wear the traditional Chibabela skirts, with mutiple strands of twisted beads wrapped around their hips and adorning their necks. Wire bracelets adorn their bare ankles. A kudu horn is treasured as a lead musical intrument, as are wood and skin drums. 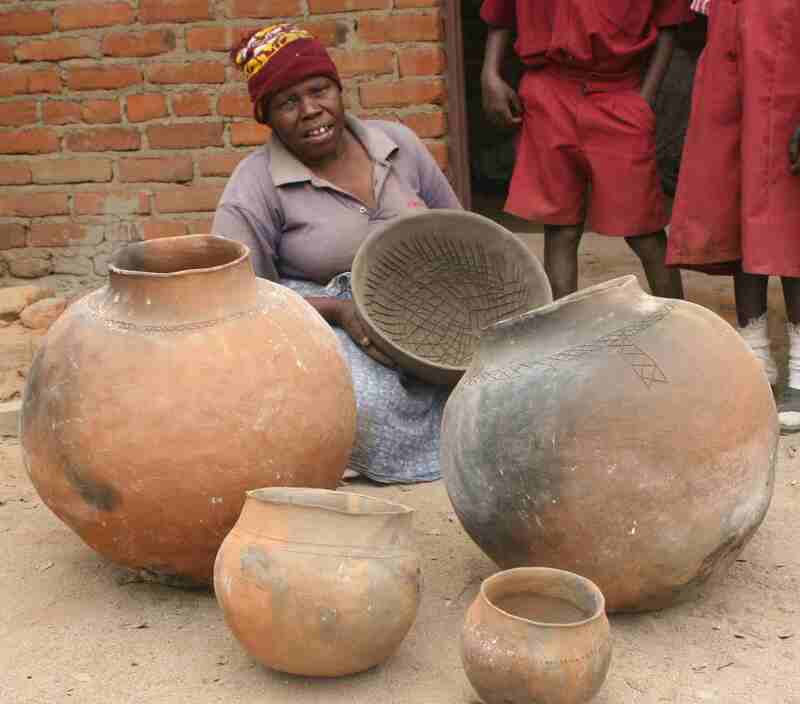 Musical wind and string intruments such as Tingoma, Chizembe, Chitende are still made. Ladies enjoy the piercing sound of tin whistles to lead their dance troops. A vibrant tradition of oral story telling survives, with engaging and amusing, often dramatic and semi-tragic animal and human characters as the protagonists. I call it Changana rap! Chanting and repetition engage the listeners, who frequently and enthusiastically respond with known chorus lines. 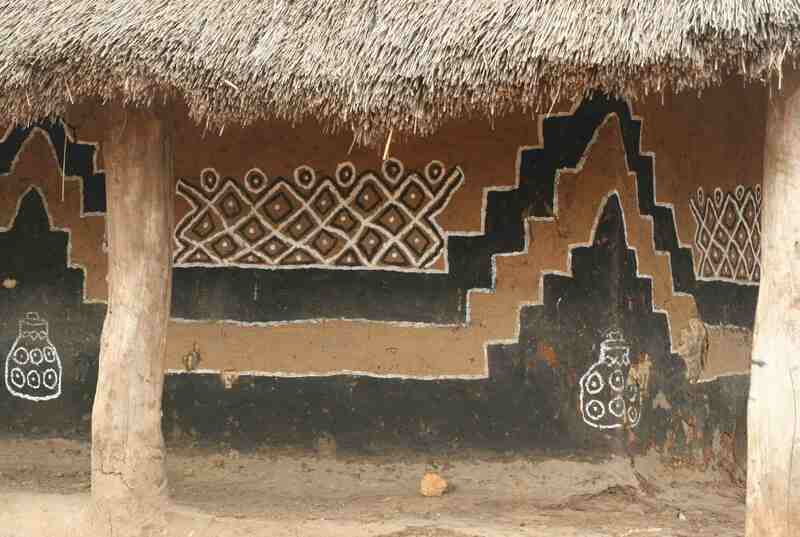 Changana huts are built square, with deep shady verandahs and decorative wall paintings created by the womenfolk. They use organic materials to paint with-silt from rivers for black pigment, red earth for the rich rust pigment and white ash from burnt leadwood trees for the white pigment. Hut floors are smooth mixtures of mud and cow dung. Wooden doors are commonly used these days, but in the past incredibly resilient and long lasting doors were constructed from cross-laid Phragmites reeds, bound securely with plaits made from Lala palm fronds. True works of art. In October 2011, the two local traditional Chiefs, Tshovani and Mahenye organized a Saila (a traditional and a sustainable method of harvesting fish). 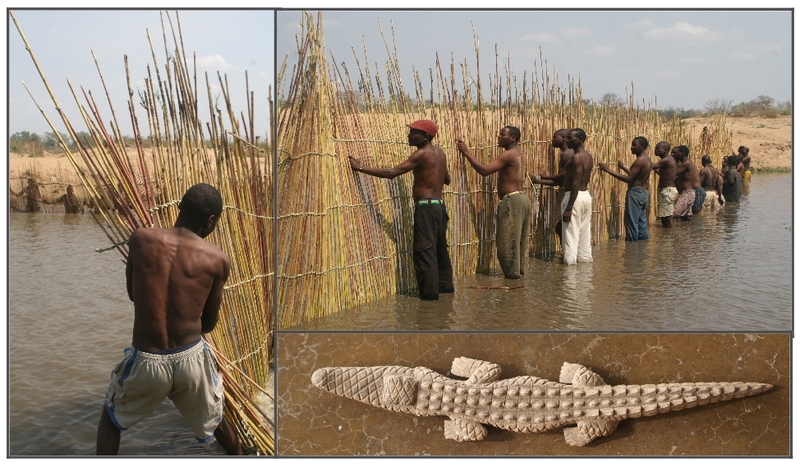 Some years ago, using traditional tools such as fish traps, nets and interlaced reed screens, these fish drives used to be done annually based around the great rivers of the Gonarezhou Park, the Save and the Runde rivers, and all the fish harvested were shared equally among the two chiefs and their people. In an effort to try and restore the glory of the Changana tradition, the current Changana chiefs received National Parks permission to continue this valued tradition. Stakeholders were informed and invited, including National Parks. This function was also supported by Parks since they supplied food and fuel. For the Saila, a team of about sixty men is selected to begin the Saila preparations, i.e. cutting of the reeds and making the screens. Screens are constructed from Phragmites river reeds and hand-made string rolled laboriously from the leaves of the Lala palm. 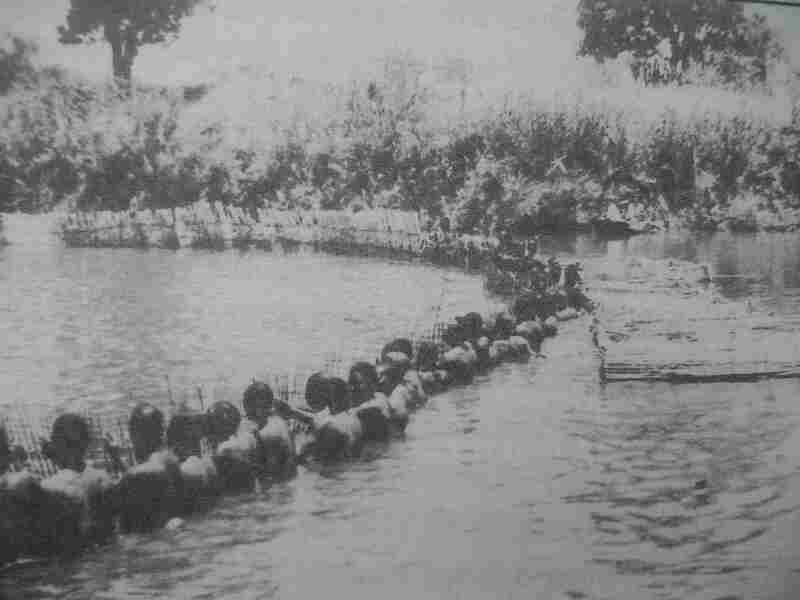 A suitable pool is also located in the Runde River and on the day of the Saila, the Chief attends and a certain old man enters the pool first and walks across twice, with traditional medicine in his hands, to dissuade any crocodiles from attacking people. He then commands the team to get into the pool and started pushing the reed screens. On occasions during the event, a crocodile is likely to bump into the screens but that does not deter the team. It takes about four hours to push the Saila screen through the selected pool. The harvest can be low and in 2011 only about 35 kg of fish was harvested, but the elders seemed well satisfied with the proceedings. The species with the highest number caught was tiger fish and the following fish species were identified after the whole process. Excited and nervous mothers and families gather in anticipation, dressed traditionally in Chibabela skirts and carrying sleeping mats made from reeds for their initiate sons and brothers to sit upon, since during the final ceremony initiates may not let any part of their bodies touch the earth. Now the initiates shuffle forward, heads down, into the Chief’s presence, accompanied by the ecstatic and chanting mothers who lay mats for them as the long lines snake into place and the initiates are seated before the Chief and headmen. They beat their striped sticks in time, an eerie and powerful sound…. The colourful women dance troupe of the host village perform a stamping, jumping dance in front of the initiates and the Chief. The ceremony is long, exhausting and many young initiates droop in the heat, to be offered water from gourds by their protectors. At last the initiates stand, considered to be adult men now! As they exit the ceremonial ground, their families fall into place beside them, dancing and singing with joy and escorting them home, enveloped in clouds of happy dust, to their individual villages where the festivities will continue unabated for days. 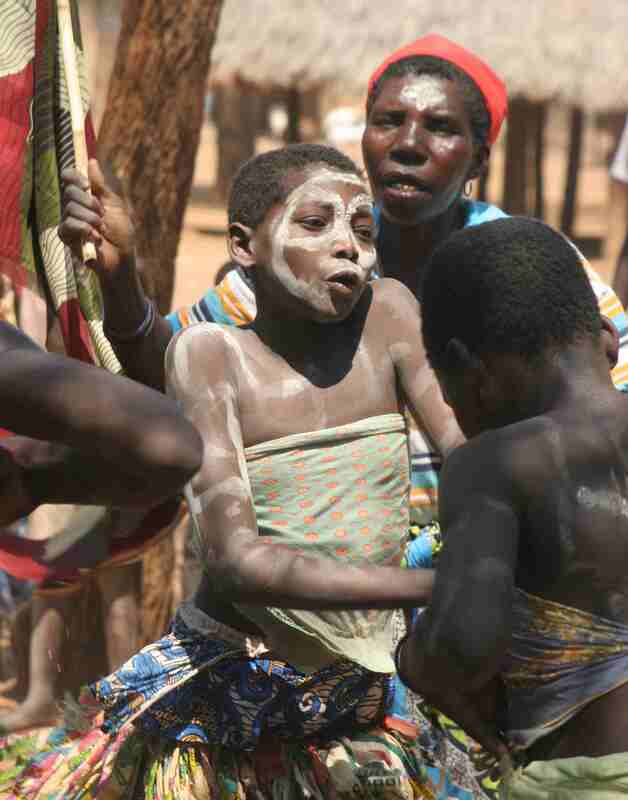 Much as Changana men undergo certain rites of passage to be considered adult, so do Changana women, but circumcision is never part of the ceremony. The girls undergo a month of strict isolation from village life, with teachers to guide them, and are instructed in the ways of child-bearing, traditional dancing, home-building, food preparation and culture that adult women are required to know. When they pass out, they are said to have undergone Khomba, and wear red caps with pins adorning the rims, which passers-by are expected to contribute to by donating more pins. Great ceremony is observed, as this episode in the lives of the women of the community is a highly regarded ritual. Nice blog and photos, thanks for sharing. I do love the music and the singing. I adds the beauty of Zimbabwe. I wish I could live there. They are two separate groups, Tsonga originate where is now Mozambique and Machangana are Ngunis which were led by Soshangana to go and swallow Tsongas. You have to be careful when you ask that question, Tsonga will agree with me but Mochangana will try to decorate it. Lost nation,some call themselves machangana,Vatsonga or Vatsonga machangana,Comfused nation and identity problem.But the reality is tht machangana are ngunis of soshangana nxumalo.So it is amazing when Vahlengwe n many others belongs to Nxumalo Surname/family.Vatsonga in particular in Zim. Moz n swazi ar lost. That is not true Mr. Gobleman. The only unfortunate part is that it depends who tell our history, and mostly our history is told by people with distort information. Here is the truth. Tsonga is a collection of all the related sub-languages or dialects such as Rhonga, Hlengwe, Tswa, Copi (Chopi), Ndau, Ngoni and other smaller ones. This language was formalised by the Swiss Mission such as Henry Phillip Junod Senior and later Junior before the Berlin Conference in 1884. Before SoShangani, there were two kings of all Tsonga group called Gwambe, and later Dzavani. These kings were from the Great Zimbabwe empire and later under Mapungubwe But these kings and the Tsonga kingdom dis-integrated over time. Then SoShangani came around 1820’s and started unifying all the Tsonga sub-groups under Gaza Empire across what is known today as S.A, Zim, Moza, Swaziland & Zambia. This is where the history gets distorted. Now that Ive summarized basics, Tsonga its the language and Shangaan refers to the kingdom/empire of all Tsonga sub-groups. The ruler is thus SoShangani who is yes Nguni. SoShangani’s surname is Nxumalo/Ndwandwe/Mkhatswa. However, Tsonga is official recognised in South Africa as both language and people whereas Moza, Zim and Swaziland still regard Shangaan/Shangani as both language and the people. Confusion is now removed. Tsonga and Shangani are not 2 separate groups. Tsonga is a language and Shangani merely refers to the kingdom/empire of all the Tsonga sub-groups as ruled by SoShangani. We ended-up adopting Shangaan as paying homage to SoShangani our king bcoz he unified all the Tsonga sub-groups into one kingdom. It is also not true that Nguni were not part of Tsonga until SoShangani. The fact that both Shaka and SoShangani wanted to co-opt Tsonga sub-groups into their kingdoms, its bcoz they knew that Tsonga were also Nguni. Actually, the Tembe, Makwakwa and other Tsonga paramount chiefdoms occupied what is known today as Northern Kwazulu-Natal before the Mfecane wars and later Shaka’s time. These groups of Tsonga origin still inhabits those areas even today, including the Nkomati and Save/Sabie rivers and Drakensberg mountains. We normally do not hear much abt these Tsonga groups in Kwazulu-Natal bcoz they are wrongly regarded as Zulus, of which apartheid is to blame. In conclusion, Tsonga are Bantu and their language is classified as Niger-Congo origin. Both Bantu people and Niger-Congo languages also include Nguni speakers. Thus, Nguni are part of Tsonga as a people. In Tsonga we call Nguni as Ngoni. Those who believe in African Religion also know that within Tsonga people, we mainly have Ngoni, Ndau and Copi ancestral spirits. Those who disregard SoShangani and his great contribution to the unity of all Tsonga sub-groups are just nothing foolish and ignorant to HISTORY. We must give credit that SoShangani did to unite Tsonga groups under immense reality of fighting both the Portuguese, British and Dutch infiltration and colonial rule. SoShangani did not fight for the unification of any other kingdom or nation but for the Tsonga. After Gwambe and Dzavani fall, no one fought fiercely and reclaimed the Tsonga kingdom until SoShangani did. Why do we blame him that he was Nguni, where were the Copi, Rhonga, Tswa, etc. to reclaim the greatness of Tsonga people??? If SoShangani and his subsequent inheritors did not fight for our independence, we would have been assimilated by other groups close to our geographical locality. But because SoShangani was so great and fiercely respected as the Lion of Gaza, no one waged any war against the Tsonga across the horizon including the Zulus themselves. What I’ve seen within the Tsongas of rejecting one of their own like SoShangani and Nghunghunyani, who fought for their course and independence Ive never seen with any other group. Ive to say this is utterly stupidness to reject your own king and ruler, who fought to keep the kingdom intact against all odds. Ive never seen the Zulus rejecting Shaka with all his atrocities, the Ndebele never reject Mzilikazi, the BaPedi never reject Sekhukhune, and the Venda never reject Dimbanyika nor Mphephu as their kings. Then, what is wrong with the us (Tsonga), I ask??? Something is truly wrong with us. As my surname is Mhlongo (popularly known as Hlongo in Moza), I am a true Rhonga of the Dzonga Paramount Chiefdom which was in existence and independent in Mozambique before its ruins in the 1820s, and I will not be foolish nor ignorant that there is also the Mhlongo’s of Nguni within the Zulu, Ndebele and Swati, and I recognize them as brothers. There is no difference my brother. South Africa officially refers to Tsonga as both language & people, then the word Shangani becomes informal because its not an official name. However, Mozambique, Swaziland and Zimbabwe recognise Machangani and Xichangani as both the people and language. Tsonga is thus a language and Shangaan is tribute to the kingdom or empire of those Tsonga people united under SoShangani’s rule in the Gaza Empire. We ended-up adopting Shangaan as paying homage to SoShangani our king bcoz he unified all the Tsonga sub-groups into one kingdom. There are also earlier kings of the Tsonga groups such as Gwambe and later Dzavani, who were from the Great Zimbabwe Empires and later Mapungubwe. and we visited them in Chiredzi. I personally would like to attend the chief Mahenye festival-particularly to witness the fishing festival and other activities. A hi khomaneni, va ka hina! Risimati Mathonsi risimathonsi@gmail.com or visit me at http://www.watu-wazuri.co.za. A hi yeni emahlweni hi hlayisa mfuwo ni ndzhavuko wa hina machangana. Swa tsakisa leswi. Very well done Manthonsi. Let us continue to educate our people especially other Machangani bcoz they are stil ignorant and lack vast knowledge about ourselves. The moment a Tsonga/Shangani person gets confused and start defining who is Tsonga and who is Shangani then we have a BIG problem, and we wonder what do u seek to achieve??? Ive never heard the other African groups getting confused by categorizing language and their kingdoms. we dont necessarily need to gain anything, but we must put records straight. our history was distorted. why do we want to act as if Vahlengwe a va exist here in Zimbabwe. there is no need to equate shangani to Tsonga. n’wana na mutswari a va ringani. tinyimba ta ku hambana makes up VATSONGA, i.e Vahlengwe, Vahlave, Vabila, Van’wanati, Vadzonga, Vahlanganu, Vakhalanga, Machangana. not forgetting Vatshwa ni Varhonga. there is no problem in knowing your lineage. Its very intresting well done machanghana. i am very much thankful to those who preserve good African Culture like the Machanghana male and female rites of passage. As an African do not know how i can partake in those wonderful ceremonies. can someone help me find the right way to go about it. Awesome. very interesting authentic presentation of a culture which should be preserved.thank you for putting this together which provides a record to educate people who visit this site. 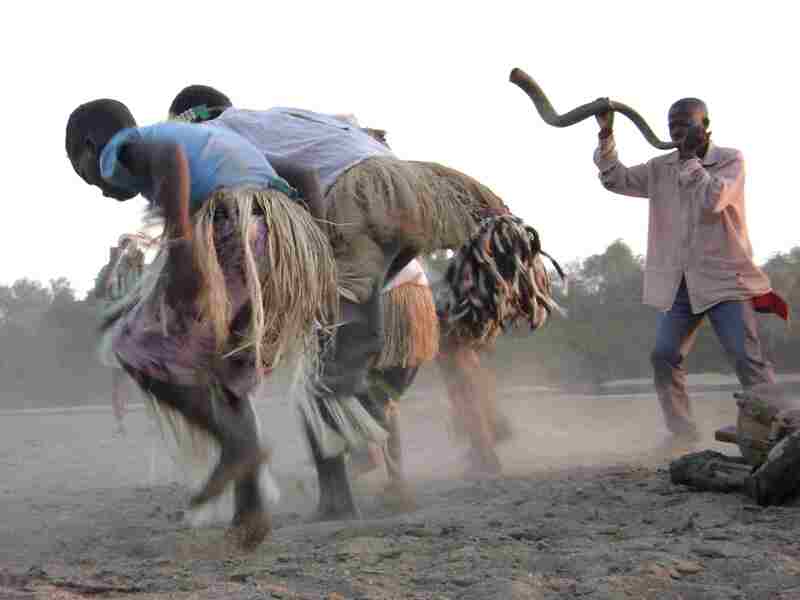 Festivals such as this of the Machangana Culture are a key component of a diversified tourism experience and should be encouraged.A tourism circuit involving festivals around Zimbabwe would be greatly interesting and would help to understand the different traditions.Is this something which can promoted? Can some one with in-depth knowledge, please tell us how did these people end up in Zimbabwe since other Shanganian are here in South Africa ? Berlin Conference of 1884 that divided Africa into the countries as we know them is the main reason/result why we have Shangaans in South Africa, Mozambique, Zimbabweans, Zambia, Swaziland and Malawi. The Gaza Empire of SoShangani stretched along all those countries before the Berlin conference. We must also know that SoShangani merely intergrated or reclaimed the people of Gwambe and Dzavani kingdoms that took place in earlier times in the Great Zimbabwe and later Mapungubwe. would you please share any link, any books that would help me to learn more about my culture, the fact that I know nothing about my culture it feels like I’m a lost soul. Please help with anything you have. I am pleased by your first step 2 know your history, n thank you 4 the eagerness 2 learn. Please go to http://www.pinterest.com and search Gaza Empire, Tsonga People. It will lead to many exciting and detailed info about our people, history, geographical stretch of the Gaza Empire and culture of what is known as Tsonga or Shangani nation in different SADC countries. Yes this is a nice culture of machangana,mahlengwe or matsonga. Am one of them in the Mahenye village. I wonder if this traditional culture is not subjected to delay our brains in the world’s new advancement in technology.The komba system doesnt match with the world we are living today. The only thing which is great in our machangana villages is the way we deal with wild animals,thats an excellent part of our life as machangana. Despite the grandeur, rationality and an overt manifestation of a people who pave for a tangible right to existentialism amidst a poverty of resources, I still feel that the Zimbabwean Vatsonga should identify themselves, not with Soshangana Manukosi, (the Nguni Invader), but with the Tsonga ethnonym if they are really serious about becoming what they aspire to be. Identifying themselves with an antique political oppressor can only perpetuate their ethnic undermining in a country where they have just constitutionally (and still largely in principle and not in practice) ceased being labeled minorities, marginalised etc. Please search back and locate yourself historically before you look into your future. Mavito ya na xiave lexikulu eka ku nyika ntshuxeko na ntshikelelo erixakeni. U nga va loyi a tshuxekeke kambe wa ha rhwele ndzhwalo wa Soshangana, sweswo swi ta endla leswaku na tinxaka timbe ti ku vona a ri loyi a ha tshikeleriweke. My name is Benjamin Xotiwani Khosa. Our father told us that we originated from South Africa,into Swaziland,into Mozambique at a place known as Bileni.However our father gave us confusing details about our totem.He said we do not have a totem.Certain things which happened while he was alive point out to these animals;Antbear(Sambani,Hweru,Gwerekwete)Engish name uknown(Gwizo,Mahelana)Is there someone older than me who can shed some light on the above? Benjamin, don’t crack ur head over nothing and confusion, but Im happy ur seeking knowledge and correct info. Tsonga people a.k.a Shangaans covered vast areas of Southern Africa and they still do even today, such as South Africa, Mozambique, Zambia, Swaziland, Malawi and Zimbabwe. However, we are categorized differently in SADC, but we are one and the same people. 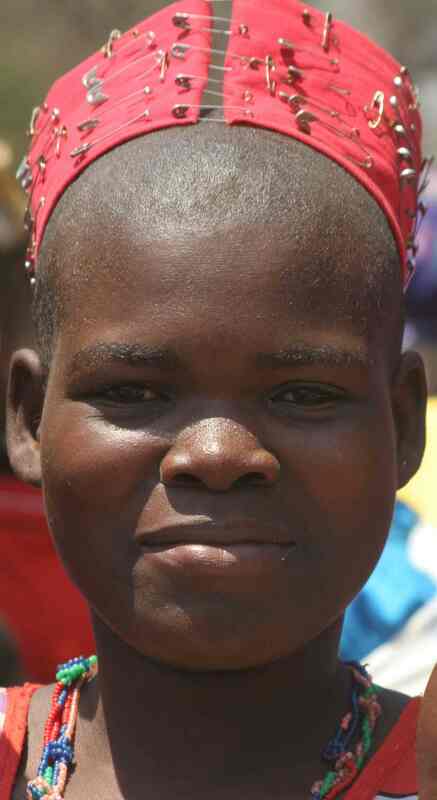 As for our origin,Tsonga people are Bantu people and their language originates from the Niger-Congo category. We are where we are today due to migration that happened over thousands of years. The only unfortunate part is that it depends who tell our history, and mostly our history is told by people with distort information. even in Zimbabwe the name shangani is an imposition over us dr Mhlongo. i will deny to be called by someone s grandfather’ s name. i am not a Mkhatswa, na ala mina. dont confuse people further by saying he united us . when his kingdom disintegrated what happened also. we still maintain our traditional leadership as Vahlengwe here in Zimbabwe since time immemorial. a hi n’wi tivi Soshangani ka misava leyi. Proudly mutsonga saluting flying our cultural flag high. proud to keep the culture vibrant ,am a Xangani origin but i never been at the area , only my father new more. Self-recognition and pride as Muchangani/Shangaan its all that matters. Hiding our true identity is the most injustice that we as individuals can perpetuate to our people and history. It doesnt matter that much where one resides or geographical location, bcoz we know very well that history is not on our side, and there is no way we could have controlled that. There’s more that needs to be revised. We’re not Machangana but Vatsonga. We need to know the Vahlengwe land boundaries. We need to know all the Vahlengwe chiefs. The is nothing wrong 2 call yourself Tsonga or Shangani or use both interchangeably. Tsonga is our languange, Shangani refers to our kingdom/empire that united all Tsonga sub-groups. So Tsonga and Shangani cant be split. After the fall of Gwambe and later Dzavani kingdoms who ruled over all Tsonga groups in Southern Africa, SoShangani revived that unity before the Berlin conference that African countries as we know them today. The Tsonga/Shangani became the victims of the split, bcoz we ended up in different countries like South Africa, Mozambique, Zimbabwe, Zambia and Swaziland. Hanyani speak for yourself! You are confused on Tsonga/Shangaan, but we are not confused at all. Tsonga is our collective language, and Shangaan is paying tribute to our kingdom/empire. And there is also nothing wrong in recognizing Tsonga as both language and people in South Africa whereas Zimbabwe recognize Xichangani/Machangani as both language and people. Why do we waste precious energy and time on useles things like boundaries, bcoz we know those boundaries were distorted and destroyed by the Berlin conference. What is more important now & the future is to support initiatives like the GLCTF & MCAF in Zimbabwe and other initiatives in SADC Countries to market and uplift our history, culture, tradition and tourism as TSONGA/SHANGANI PEOPLE. We must support each other, anyone and everyone whether Black or White who uplift our people, culture, tradition, tourism and so forth. Thus chasing pertinent issues will never bring us development and self-determination. Thus we need to change our mindset & attitudes towards what is beneficial to us and what is holding us backwards. Please check the boundries or geographical stretch of Gaza Empire and the different Tsonga sub-groups by 1854 as captured by H.A Junod of the Swiss Missionary. Inkomu (thank you) to the wildlife&wilddogs team for such a wonderful blog about my people. Please continue to tell our stories. I’m a Shangaan in South Africa, and do not mind the confusion that you may come across due to lack of knowledge by different people in S.A, Mozambique & Swaziland or even Zambia and Malawi. The Shangaans use different official names in Zimbabwe, Mozambique, Swaziland and South Africa. In South Africa our official name is Tsonga. However, these are one an the same people. In essence, Tsonga refers to the language of the people, and Shangaan refers to the kingdom/empire of the people united by SoShangani. Bravo again for this beautiful blog. As for me and my family, we support the wildlifeandwilddogs.com, GLCTF and MCAF. Continue the good work in marketing and uplifting the Machangani culture, tradition, tourism and places to the world. Not many people would know about this if it was not for your CONTRIBUTION. Keep-up the good work, and know that some of us appreciate greatly your work and we are also forever indebted to your work. This is a true spirit of being an African, when u acknowledge and tell the stories of others without any racial or tribal lines. Like our forebearers in the Great Zimbabwe, Ashanti of Ghana, Berbers of the Sahara Desert, Kingdom of Timbuktu, Kingdom of Mapungubwe, Kingdom of Egypt, Kingdom of Ethiopia, and Gaza Kingdom, who understood the beuty of cultural diversity and the contribution of sub-groups with a kingdom, WE SALUTE YOU. We are planning as a family to travel and join our Zimbabwean Shangaans in their annual cultural fair as we do with the other Tsonga groups in Giyani, Malamulele, Bushbuckridge, Mokopane, Tzaneen, Tembe/Richardsbay/Pongola areas in KZN, Mozambique (Bileni Masia, Maputo, Gaza Province). this page helped me a lot as a father and a husband i was straggling about what im going to teach my son when he grows up because my father was never around to teach me about my culture. Na khensa (thank you) Jabu for your positive response boti wa mina. we cant interchange a dialect or a subgroup with the mother Language or group. to say shangani is interchangeable with Tsonga is a misplaced conclusion. its very premature. Write the things that you know, I will write what I know, then case is closed! I would like to see what you’ve published, I assume it is definitely peer reviewed by insects 🤔😅😅. This reply above is directed to Ashton Baloyi in response to him hating what we are writing. We are not in this blog to nurse people’s egos. I am sorry to be joining your interesting conversation somewhat late. Several months late in fact. My grandfather Bayiseni was a Nguni Shangani married to a Ndau woman. My father’s name was Mathongonyana which was also my grandfather’s name. My Grandfather and father spoke Zulu and Ndau. I have a ndebele mother and so I speak Ndebele. Spent years in Harare and so I speak Shona too. I am an applied mathematician but history is a serious hobby of mine. My grandfather identified himself as Nguni under Ngungunyane and his ears were pierced in the same way as my maternal grandmother whose father came from zululand, not with Mzilikazi but with the pioneer column and then settled with the Matebele. I find some of the information here interesting but perhaps not entirely accurate.Dr Musa Mhlongo seems very knowledgeable but perhaps more in touch with his Tsonga side than the Nguni side. Musa is Nguni isn’t it? I think it is reaching too far to say that Shangaan is interchangeable with Tsonga. Many post SoshanganeTsonga have Nguni blood haven’t they? So why is the Tsonga side stronger than the Nguni side? Jabulani Nkosi are Nguni names aren’t they? What about that side? 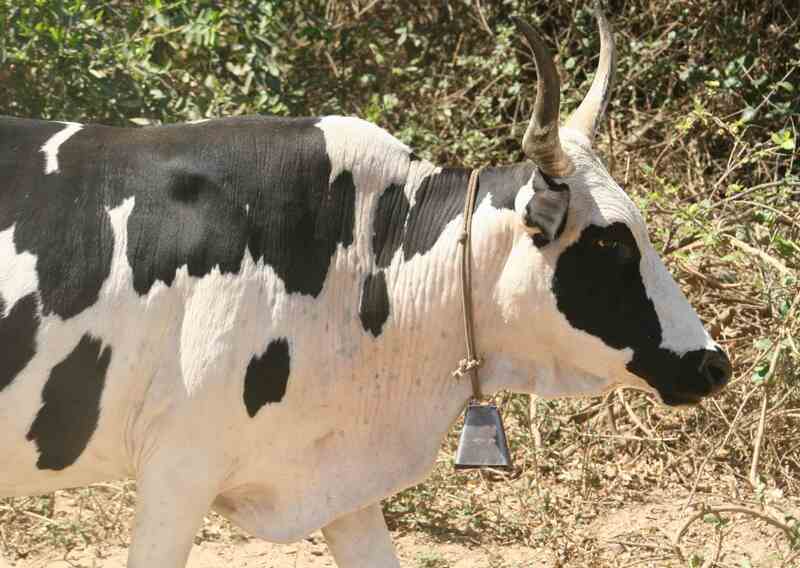 Soshangane may have been an invader in the 19th century, what about the Nguni blood in you? The Nguni words in your language and words.I don’t know Tsonga but I could work out some words.